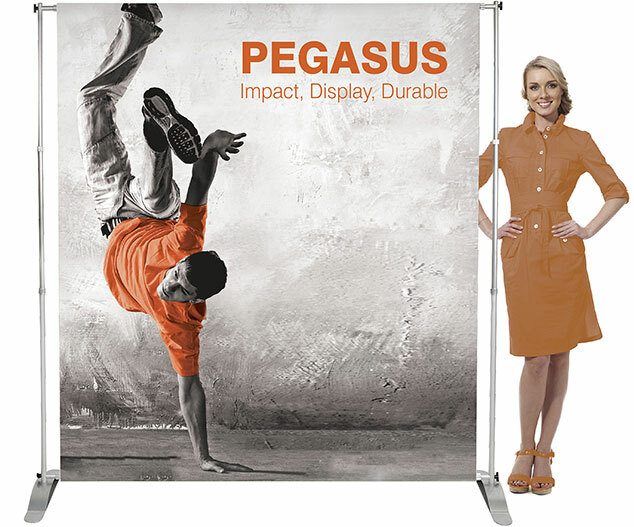 Pegasus is one of the largest format tension banners in the range making it ideal for exhibition environments, backdrops and branding. It is both height and width adjustable, making it flexible enough to fit all kinds of venue. As it is extremely lightweight and breaks down to fit a small carry bag, it is very practical for portable display applications. To supply print ready files please set your artwork up to the visual graphic dimensions, add 70mm top and bottom, 10mm bleed to all edges and crop marks. Supply the file to us as a hi-res pdf with all fonts embedded or outlined and the colours set to CMYK. Images need to be 72dpi minimum in the artwork when at 100% size to ensure the best quality images are printed.